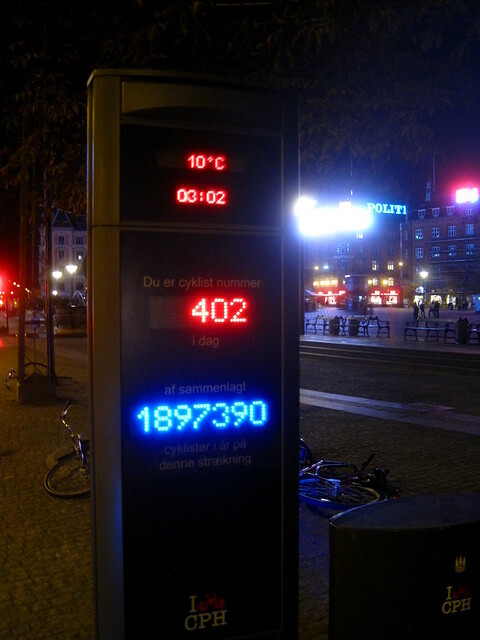 It's not every day I roll past one of the bicycle counters in Copenhagen at 03:02 in the morning, but I did last weekend on my way home on a Saturday night last weekend (shockingly early by Copenhagen standards). This counter is not on a route that is busy during the nightlife mouvement; most people are bar-hopping in the neighbourhoods, but 401 people on bicycles plus me - double that number for both sides of the street - in the first three hours of the day isn't bad, I suppose. There are 25,000 cyclists on this route, in both directions, each day.